Butler Ballet and the Butler Ballet Orchestra bring The Nutcracker to the Clowes Memorial Hall stage November 29 through December 2 for six performances of Central Indiana's only fully staged production of Tchaikovsky's holiday favorite. Tickets are $28-$58. They are available at the Clowes Hall box office or through ButlerArtsCenter.org. For the first time in several years, a Butler student—20-year-old Amber Wickey, a junior from Tenafly, New Jersey—will dance the role of Clara, the girl at the center of the story. Typically, a young dancer from the Indianapolis community plays the role. But Dance Department Chair Larry Attaway said that in this year's auditions, Wickey stood out. "It's really a difficult dancing role, and you need to have that wonderful childlike quality and all of your technique chops to handle it," he said. Wickey, who is 5 feet tall and therefore able to pass for someone Clara's age, said she was ecstatic to get the opportunity. Wickey performed in her first Nutcracker when she was in fourth grade and, as a sophomore in high school, danced as Clara in a production at the Nunnbetter Dance Theatre in Bergenfield, New Jersey. Wickey said other dancers have more technically advanced parts, but Clara is an extremely demanding role, as she has to dance in the Party Scene, the Battle Scene, and the beginning of the Snow Scene, and she has to be onstage for much of the second act. "The most difficult part is maintaining a character for the duration of the entire show," Wickey said. "You have to act—probably more than any of the other people in the production. And then you have all that dancing in the first act, and then you have to act throughout the second act. So, in terms of stamina, it's really challenging." Also challenging, she said, is maintaining the mindset and innocence of a 12-year-old. "She's the one who gets the nutcracker as a gift, she's the one who Drosselmeyer adores, she follows all the rules, everybody loves her. So, to be that innocent child is a hard part of the role," she said. This year's Nutcracker will include 38 young dancers from the community. In addition, there will be new choreography from Professors Derek Reid, Cynthia Pratt, Michelle Jarvis, Marek Cholewa, Rosanna Ruffo, and Ramón Flowers. Reid is choreographing the Party Scene and the Battle Scene. "As many times as we've done The Nutcracker, it still continues to change," he said. "That's a good thing, I think. Every time we change something, the magic comes back. I think it's going to be a really exciting Nutcracker once again. I hope everyone comes to take a look." Butler Ballet and the Butler Ballet Orchestra bring The Nutcracker to the Clowes Memorial Hall stage. The Stage Manager, Emily, George ... and the Provost? When she makes her theatrical debut on Wednesday, November 11, Butler University Provost Kate Morris hopes to portray a professor with the same competence she has demonstrated in 20 years as an actual professor. -Vice President for Student Affairs Levester Johnson, with an after-party featuring live mascot Trip (Thursday, November 12, at 7:00 PM). -Performing and Fine Arts Librarian Sheri Stormes (Friday, November 13, at 7:30 PM). -Jon Van Ness ’71, whose final Butler Theatre production as an undergraduate was Our Town (Sunday, November 15, at 2:00 PM). 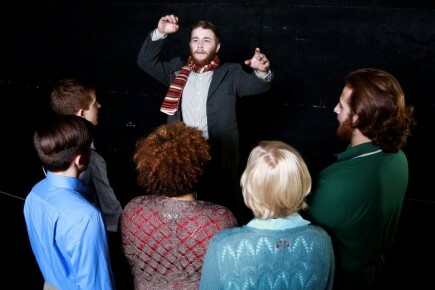 Butler Theatre Professor William Fisher will handle the role at the student matinees on November 12 and 13 at 9:30 AM. Tickets are $8 students with ID, $13 seniors, and $19 adults for the public performances. They are available during regular business hours at the Clowes Hall Box Office, and anytime online at www.butler.edu/theatre. Fisher said there were two distinct ideas behind using guest actors. One was that “we wanted this production to feel grounded in Butler and be here—and not to pretend we’re in New Hampshire.” So there will be no period or stylized costumes, and no New England accents. But the location—Grover’s Corners—and historical references remain intact. The other influence was a British comedy called The Play What I Wrote, which featured a revolving cast of celebrities playing themselves in an otherwise fictional setting. The rest of the show will be instantly familiar to those who have seen Our Town, a play that Fisher said has taken on even more relevance with its message about the importance of being present in the moment.